I'm excited to share this eight-part series with all of you! I've been planning it since last fall, and so many of you have contributed and shared your insight. One of the things I love about the vintage community is that we're a motley crew tied together only by a love of old fashion. Literally everything else about us is totally variable, even the reasons why we wear old fashion. 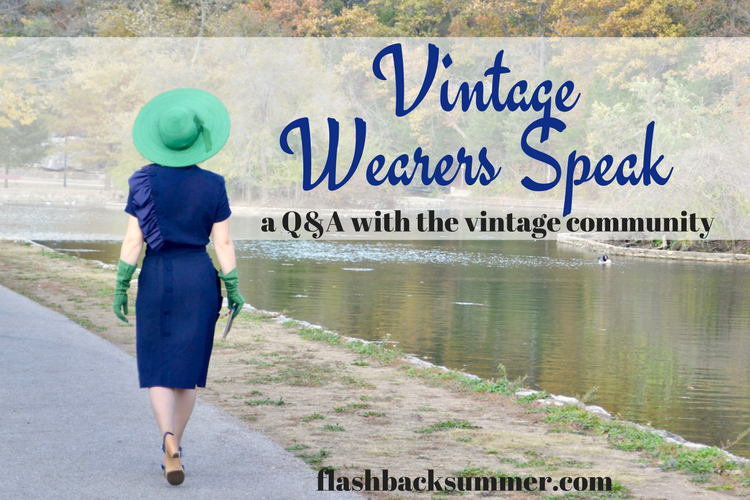 I've enjoyed getting to know many of you and to learn the complexities of vintage wearers and their lives, and I hope this post series showcases this diversity a bit more. As well... I've scheduled such a long post series because I'm away! Believe it or not (and speaking of variables in life), I'm actually at military training. Yes, the U.S. military. I'm in training to become an Air Force officer, and I will not be wearing any vintage for the next couple months while I work on that; it's all camouflage for me! So stay tuned until I get back and I hope you enjoy the series! - When you first started wearing vintage, what was one thing that encouraged you to continue? - What is one of your favorite interactions you've ever had with another vintage wearer on social media or a blog post? - What non-Western fashion aesthetics are you particularly attracted to or draw inspiration from? Why? - What is one area of vintage style that you struggle with? - Have you developed any new skills as a result of your interest in vintage style? What made you decide to take them up? - When do you NOT wear vintage styles? What modern clothing is in your closet? - If you could give one piece of wisdom or advice to vintage (reproduction or vintage-style) brands as an influencer and/or consumer, what would it be? Why is this important to you? What a fabulous series! I can't wait to read everyone's answers! Can't wait to read this! It sounds fascinating.